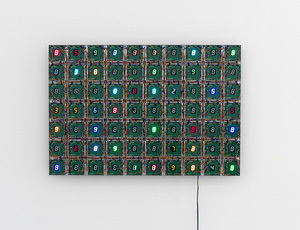 Tatsuo Miyajima is one of Japan’s foremost sculptors and installation artists. 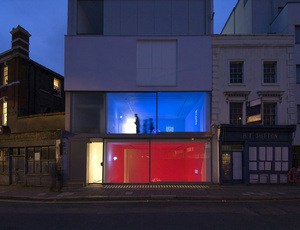 Employing contemporary materials such as electric circuits, video, and computers, Miyajima’s supremely technological works have centred on his use of digital light-emitting diode (LED) counters, or ‘gadgets’ as he calls them, since the late 1980s. These numbers, flashing in continual and repetitious – though not necessarily sequential – cycles from 1 to 9, represent the journey from life to death, the finality of which is symbolized by ‘0’ or the zero point, which consequently never appears in his work. This theory derives partially from humanist ideas, the teachings of Buddhism, as well as from his core artistic concepts: ‘Keep Changing’, ‘Connect with All’, and ‘Goes on Forever’. 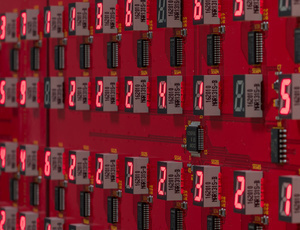 Miyajima’s LED numerals have been presented in grids, towers, complex integrated groupings or circuits and as simple digital counters, but are all aligned with his interests in continuity, connection and eternity, as well as with the flow and span of time and space. "Time connects everything", says Miyajima. "I want people to think about the universe and the human spirit." 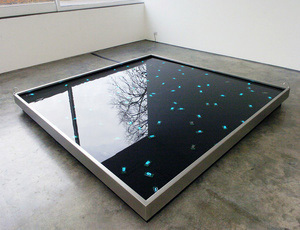 Tatsuo Miyajima was born in 1957 and lives and works in Ibaraki, Japan. He finished undergraduate and postgraduate studies at the Tokyo National University of Fine Arts and Music in 1986, after which he began experimenting with performance art before moving on to light-based installations. 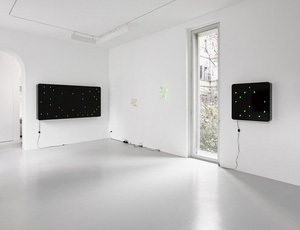 In addition to participating in numerous international biennales and important group shows, he has held solo exhibitions at Buchmann Galerie, Lugano, Switzerland (2019); Lisson Gallery, New York, NY, USA (2018); William Morris Gallery, London, UK (2018); Fosun Foundation, Shanghai, China (2017); SCAI The Bathhouse, Tokyo, Japan (2017); MCA, Sydney, Australia (2016); The Met Breuer, New York, NY, USA (2016); Capsule Gallery, Tokyo (2014); Kunstmuseum St Gallen, Switzerland (2012); Ullens Center for Contemporary Art, Beijing, China (2011); Miyanomori Art Museum, Hokkaido, Japan (2010); San Francisco Museum of Modern Art, CA, USA (1997); Fondation Cartier pour l’Art Contemporain, Paris, France (1996); and Modern Art Museum of Fort Worth, TX, USA (1996). He has participated in the Venice Biennale (1988, 1999) and in numerous group exhibitions, including ‘Change Connect Continue’, Galleria Lorcan O’neill Roma, Italy (2019); ‘The Life of Buddha, the way to now’, Nieuwe Kerk, Amsterdam, Netherlands (2018); ‘Catastrophe and the Power of Art’, Mori Art Museum, Tokyo, Japan (2018); ‘Everything at Once’, The Store, London, UK (2017); ‘Relight Days’, Counter Void, Tokyo, Japan (2017); 'Kumamoto Admirable', Contemporary Art Museum Kumamoto, Japan (2016); 'Order and Reorder: Curate Your Own Exhibition', National Museum of Modern Art Kyoto (MOMAK), Japan (2016); 'Eppur Si Muove', Mudam Luxembourg (2015); 'Boolean Expressions', Lewis Gluckman Gallery, Ireland (2015); 'Logical Emotion, Contemporary Art from Japan', Museum Haus Konstruktiv, Zurich, Switzerland (2014); 'Asia Code ZERO', Seoul Olympic Museum of Art, Seoul, Korea (2013); 'Marking Time', Museum of Contemporary Art, Sydney, Australia (2012); and 'Dome', Hiroshima City Museum of Contemporary Art, Japan (2008). In 2006, Miyajima was selected to serve as Vice President of Tohoku University of Art and Design. His work is featured in numerous public collections including British Museum, London, UK; Tate, London, UK; La Caixa, Barcelona, Spain; National Gallery of Canada, Ottawa; and Taipei Fine Arts Museum, Taiwan.